There was a knock at door #1 at 7:15am. I was sure who it was. He gave me a lift back to the treehouse and he headed back to his hotel so he could prepare room #1 for the younger brother of the nice Norwegian lad in #2. I set up that deal before leaving. It was Tuesday, January 25, 2011. I was tired. Iggy and I stuck close by the tree all day. Drank beet juice, ate bananas & oranges, napped, and read. The past four mornings had been surf mornings for me at main beach. Sounds routine enough I know, but that is right about where the plot thickened. So The Big Man showed up unannounced to the tree house this past Saturday morning around 7:30am. Chango was there. Hugs all around. I offered Dude some black coffee. He only wanted half a cup. 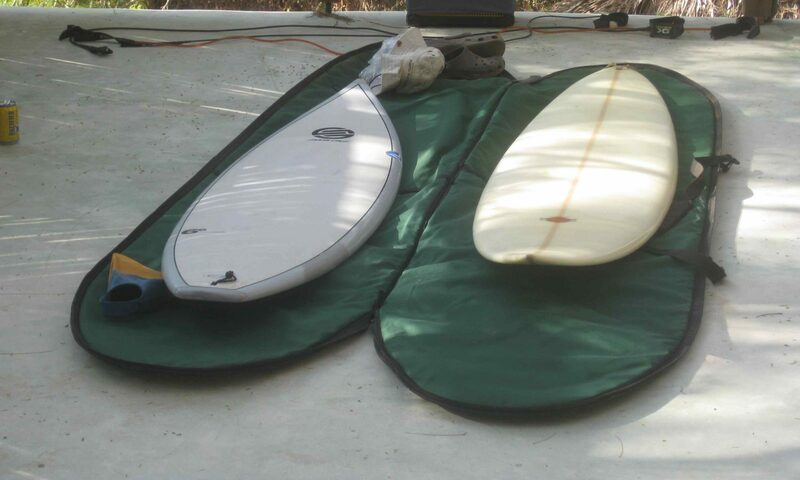 While Chango worked around the tree and went ape(pun) over the new 2011 Zeitgeist release, I went surfing with The Big Man. I asked if I could borrow a 1mil of any sort. I didn’t need it, but I sort of wanted it. Actually, I wanted it for every intent and purpose one might put on a 1mil Springsuit in powerful, unfamiliar surf. What a Puss! Yeah OK Guy!! The Dude put on zinc, and we walked across the warm sand together to have a surf. He rode a big yellow 10 footer. I stayed close to him in the lineup because it’s the right play. It was a small enough day by Zicatela standards. I picked off three waves in about one hour. As I’m not writing home about any of it, I’m just all smiles that I can live to write about it. I was bought a filling $2 breakfast, handed 15 keys on a big round ring, and was given a quick overview as to how the hotel operates. There was a Canadian woman in #3 and some other fella on the third floor Penthouse. The rest was wide open. Dude Man was off to Barra de la Cruz with the fam to get some of the big swell on the horizon. “What’s her name and what’s her story?” I asked. “Figure it out Chachi.” The Big Dude Man vanished and there I was. This all felt a bit make believe. The fried banana man blew the piercing steam whistle. Con todo I said.